Hurricane season is here, and the New Orleans Office of Emergency Preparedness is getting ready for whatever will come. Not only are they preparing for human evacuations, but now they also are mandated under federal and state law to make provisions for pet evacuations. During Hurricane Katrina, there were numerous heart-wrenching stories of people being forced to leave their pets, cats being abandoned for weeks or months, and chained dogs drowning in backyards. The Louisiana Society for the Prevention of Cruelty to Animals estimates that 70,000 pets remained in the city during the storm, and of those 70,000, only about 15,000 were rescued. 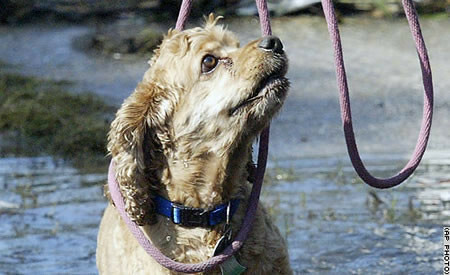 For the city’s part, in compliance with the state and federal laws enacted after Katrina, people who do not have their own way out of town will be allowed to bring their pets with them when they report to one of the 13 pickup points scattered around New Orleans. The animals â€” provided they’re in carriers â€” will be allowed on buses used to ferry evacuees to other designated sites outside the city; from there, the state takes over, using buses to move people to a network of shelters and “climate controlled vehicles” â€” namely, tractor trailers â€” to haul their cats and dogs. Ideally, owners and pets will be sheltered in close proximity; displaced people will have, if not the comforts of home, at least the comfort of a beloved pet. And shelter operators won’t be saddled with the care and feeding of someone else’s animal. This entry was posted on Thursday, June 14th, 2007 at 2:03 pm	and is filed under Other Pets, Pet Food Recalls & Safety, Cats, Dogs, National Dog, Cat & Pet Info, News for Cats, Dogs & Owners. You can follow any responses to this entry through the RSS 2.0 feed. Both comments and pings are currently closed. What a beautiful thing! I know NYC was working on including them before the laws passed, but it sure is nice to see it’s not an option any more. It is sad that human decency has to be legislated, but thank goodness it was. How does one put a black lab in a carrier? the lab will prob be allowed on if muzzled/current tags/papers. if not, they have a serious flaw in their system that would exclude large dogs, which i think would put them in violation of the law. i’m really glad that the pets are now included in the evacuation! after all, they are part of the family. YES! This is a GREAT Start! So glad to see something besides the usual lip service. This is the result if determined people working together. See…it really does work! There is now a chance to hold the family together. Even if you were so heartless to not care about leaving pets behind, it was a hazard to rescuers who came later. Where would they put a sheep dog on the evac bus? I live in New Olreans. I evacuated with my cats for Katrina because I would never leave them. I think it is great that the city is providing evacuations for pets because a lot of people stayed because it is too hard to evacuate with animals. Unless you are going to a relative’s home, very few hotels are willing to let evacuees bring their pets in rooms even if they remain in kennels. There was also no mention of whether or not shelters will allow pets. One thing that the article did not mention is that after the storm, in flooded and unflooded areas, people were forced to leave their homes by emergency officials and their pets were left behind. They had no option. If they choose to stay they essentially handcuffed them and took them away. There is also an instance when people were sheltered in a school were forced to leave their animals behind. The animals were then all shot to death. If we have a minor hurricane and I should choose to stay, I could never be forced out of my home without my babies. I wouldn’t expect to get rescued though. I just wonder how they plan on handling people who stay. Be sure to check out Tom Lantos and the Pets Act, amendment to the Stafford act. And these people were still in the strike zone when Katrina hit because….? The reason legislation is necessary is because our nation has lost it’s sense of community and personal responsibility. We believe it is the government’s job to take care of everything, hence the legislation. Your pets are your responsibility, just as the rest of your family is. Plan for your emergencies, know what you would do, where you would go. And do it before the crisis is happening. My father-in-law lost his home in Gulfport, MS but was nowhere near when it happened-nor was his dog. He was in a pre-planned hotel that acccepts pets. It was the third time that year he had left because of hurrican warnings . Many of my family have lived in hurricane areas and all of them are surprised when other residents don’t get out before the storm. I am from the mid-west, ie. tornado alley, and grew up with emergency planning as a way of life. In a tornado, you are lucky to get a 5 minute warning that a funnel cloud is on the ground. When my town was 2/3 destroyed by an F5 tornado in 1974, no one was sitting around wailing for “someone” to help. Farmers brought back-hoes, neighbors helped neighbors, the Amish were on site almost before the Red Cross. The local civilian response was amazing, but the individual preparedness is what allowed us to bounce back. Today, I live in earthquake country and have adapted my emergency plans for accordingly. Certainly Katrina was a wake-up call for our government, but my hope is that our citizens won’t exhibit their typical short attention span when it comes to crisis and take the initiave to protect themselves and all their family members. I have participated in planning efforts here in CA to set up shelters that except pets with their owners, but I don’t expect the government to take care of everything. From what I’ve read in a lot of postings from Katrina refugees, it wasn’t the hurricane that was the main problem. It went through & was over for several days, no really major problems, then the dike broke & that’s when the real trouble & damage started.